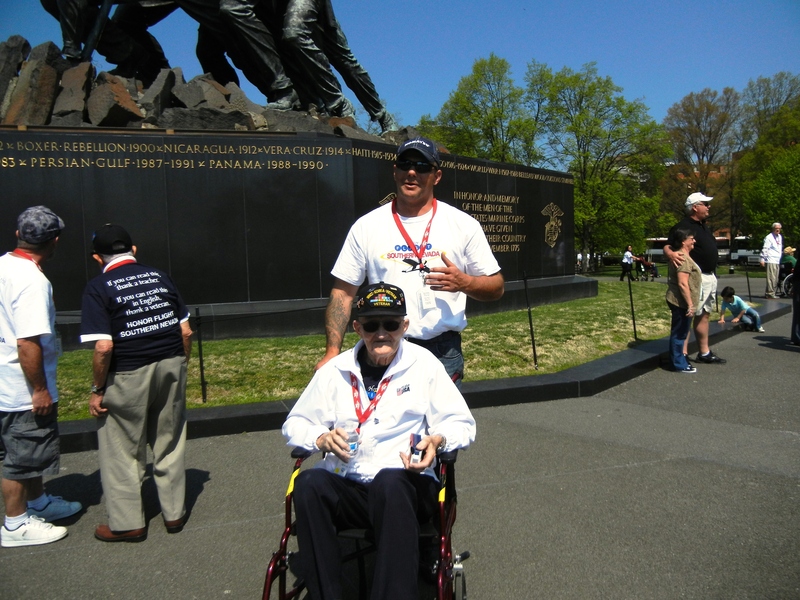 Guardians are essential to the success of the Honor Flight Southern Nevada Program. Without these hard working individuals we would not be able to carry out the dreams of so many veterans, enabling them to see the memorials built in their honor. Guardians will have a great time, seeing these memorials through these heroes’ eyes. The Guardian is responsible for all of their expenses, paid to Honor Flight Southern Nevada. Spouses or Significant others may not go as guardians unless they are a veteran. Typically during our trips, we try to pair up veterans either one-on-one or two-to-one guardian, if they are able bodied veterans. Even before the veterans arrive at the airport, the guardian’s responsibilities begin with flight preparation and going over their packets of material. Once the veterans start to arrive, guardians will ensure boarding passes and IDs are available, distribute Honor Flight Network shirts, get the veterans through security and to the gate, assist in boarding, etc. Because of the role of the guardians, it is important guardians are able to push a wheelchair all day – up inclines, lift a wheelchair on and off the bus, help should someone fall and in general be observant at all times to what is going on with the veterans. Spouses may not serve as guardians. There are physical requirements for Guardians and it is not to be taken lightly. Honor Flight Southern Nevada is a volunteer program created to honor our veterans for all they have sacrificed to make this a better world. Without the support of these volunteers, there is no way that we would be able to provide the opportunity to fly our heroes to Washington, D.C. to see the memorials created in their honor. Examples of volunteer positions include sending off the veterans at the airport in the morning and welcoming them home at the end of the trip with a cheering reception; answering office phones and entering application info into the data system; mailing requested material and purchased merchandise; as well as contacting veterans and guardians to make arrangements based on our projected flight schedules. If you would like to volunteer your services, please contact us. You can be a part of making our veterans’ dreams a reality. You can make a difference. Thank you for your support. Please go to the applications page and click on the volunteer application. I help a WWll Vet as a volunteer from VFW post 10054, He wants me to help fill application out. He is in a wheelchair and will need an assistant if he goes on the honor flight. I also am a Viet Nam Vet and service connected, I would be able to assist him but both applications would need to be confirmed together. The reason he wants to do this is he knows he will not be with us much longer. Please advise me if this is possible and I then will send applications. Thank you Richard B.